As a student, it can be pretty much impossible to hold down any sort of traditional job. Study groups and team meetings make it difficult to keep a regular schedule. Plus, if you’re just starting out, you may not be qualified for anything that will look halfway decent on your resume. And, oh yeah, do you even have a form of transportation that can get you to a job? Meanwhile, those student loans are growing larger by the second. Thank the internet gods for freelancing. I get it. I’ve been there. By reading this, you are probably putting off about a million things that you really should be doing. Like, studying for that midterm, maybe? But don’t worry, I’ve done the hard work for you. In fact, you could pretty much say that I’ve spent the last few years of my life majoring in freelancing platforms. I know the ones that have real opportunities—even if you don’t have much experience—and can actually earn you some cash. Let’s just skip to the ones that are worth your time. Plenty of Jobs Available: A freelance platform is useless if there’s nothing but workers and not enough clients, and finding worthwhile opportunities on some platforms can take time that many students can’t afford to spare. Student-Specific Skills: As a student, you probably know a thing or two about writing essays, doing research, and other marketable skills that can be sold on freelance platforms. Relatively Low Fees: If money weren’t an issue, you probably wouldn’t be looking to pick up freelance work. We considered the fees associated with each platform to ensure that you walk away with a little extra weekend spending money. Ability to Build a Portfolio: Maybe you don’t have much in terms of work experience or samples to include in a portfolio. These platforms can be amazing tools for building both. Options for Clients to Come to You: While many marketplaces expect you to actively pitch to clients, on some websites, you can just post a job and let clients come to you instead, which is perfect for a busy campus lifestyle. As one of the largest freelancing platforms available, is also one of the most diverse. With gigs that cover almost every marketable talent you can imagine—from people who will sing happy birthday on video while dressed as Elvis to those working as personal assistants—Fiverr gives everyone the opportunity to market their personal talents and abilities. Set Your Own Price: When Fiverr was just starting out, all offerings were priced at $5. Today, you price your gig as you see fit. This gives the freelancer more control than other marketplaces, where clients are the ones who post a project with an attached budget. Create Gig Packages: By creating structured, tiered packages, you can offer up to three versions of the same service (e.g., graphic design). Essentially, this allows customers to “upgrade” for “extras” (e.g., more revisions, faster turnaround time, etc.) at an additional cost. Add Photos and Video to Your Listings: Bring your offering to life and entice your potential customers by giving them a sense of what they can expect to receive when working with you. 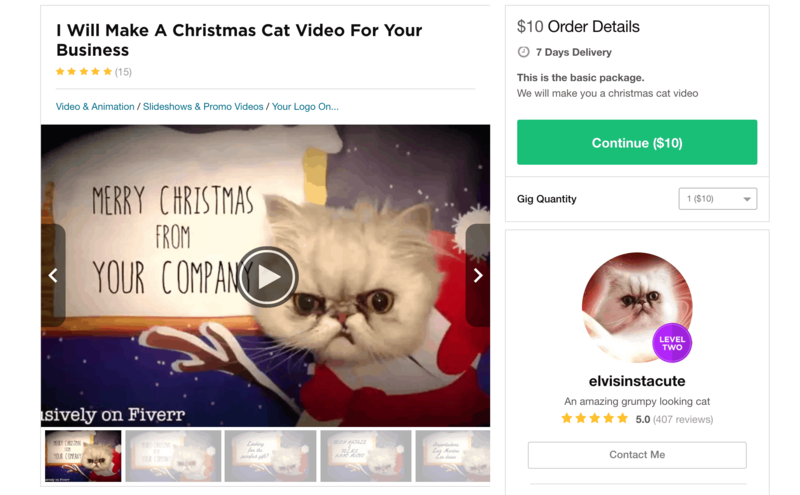 According to Fiverr, gigs that have intro videos enjoy higher sales rates. Many Loyal Customers: Due to the wide variety of skills being offered, all at great prices, Fiverr has a large and loyal customer base. Easy Way to Make Extra Weekend Money: While it may take a while to start making a regular income on Fiverr, many have found it to be a quick and easy way to earn some extra cash. A Fun and Diverse Market: A quick scroll through some of the available gigs prove that there’s no shortage of creative people with interesting talents. Unlike the other platforms on this list that focus on more “serious” listings, Fiverr includes a mix of fun, silly, and genuinely bizarre gigs up for sale. Anyone Can Make a Gig: You can sell almost anything on Fiverr, so long as it’s legal and doesn’t violate the platform’s fairly lax terms of service. It’s Possible to Earn Tips: Even if your gigs are selling at a low rate (which may be inevitable in the beginning), many buyers will add tips to orders that are well done. Saves Time Looking for Clients: Unlike other popular freelance platforms, clients come to you on Fiverr, saving you the (sometimes frustrating) experience of sending out countless bids that go unanswered. Relatively High Fees: While Fiverr no longer charges a fee for withdrawing money via PayPal, the platform does charge 20% of total seller earnings. However, this is normal for freelance websites. Can Be Difficult to Stand Out: With the ability for anyone to sell just about any crazy thing they want, there’s a lot of competition on this platform, making standing out from the crowd a bit of a challenge. Gaining a Reputation Can Take Time: Getting your first few reviews is the most challenging part of working on any freelance platform. When first starting out, you may want to underprice your offerings to encourage buyers and build your positive feedback. You have an noteworthy niche talent. If you are great at coming up with corny songs on the spot, or have the unique ability to make funny prank calls, you may be able to carve out a niche for yourself on this platform. Your skills are scalable. The majority of listed gigs have three tiers (basic, standard, or premium) that buyers can choose from. You don’t have a ton of time. Since buyers come directly to the freelancers, you won’t spend your time searching for jobs and sending out proposals. This massive platform features talent from across the globe, and invites anyone to build a profile and try their luck as a freelancer. 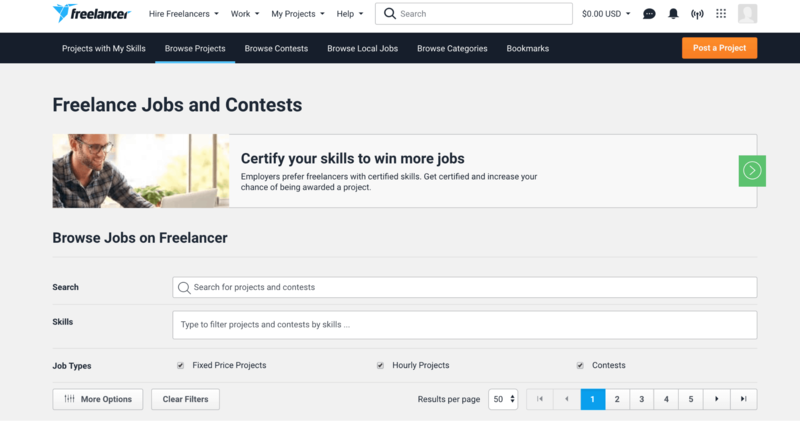 Used and trusted by millions of both freelancers and clients alike, Freelancer.com is an excellent place for students to hone their skills and pull in a little extra cash. On-Screen Chat and Notifications: There’s a chat box that allows you talk with clients while simultaneously browsing the platform. You’ll also see pop-up notifications on the bottom of the screen, letting you know when new jobs are posted. This helps you be one of the very first to submit a proposal. Search for Urgent Projects: If you know you have some free time coming up, you can look specifically for jobs that need to be started right away and have a quick turnaround time. Either List Your Services or Submit Bids: Freelancer.com gives you two options when it comes to finding work: you can post your services (similar to gigs on Fiverr) or submit bids for jobs clients have posted. No Screening Process: As a student, you’re probably in a pretty early stage of your career and may not have a ton of experience to show. This isn’t a problem on Freelancer.com, as anyone can create a profile and apply for jobs. 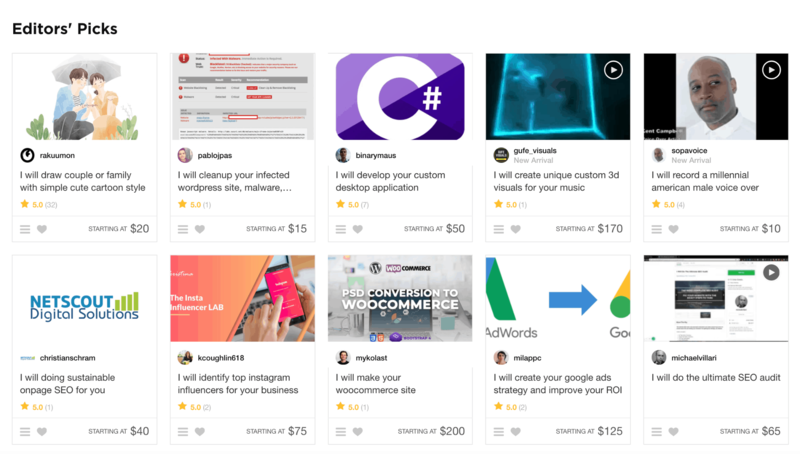 Scope Out the Competition: Unlike other freelancing platforms, you can see who else has submitted a bid for a particular opportunity. This includes viewing the freelancers’ profiles, their bid amounts, and proposed timelines. Reasonable Fees: Fees are an inescapable reality when using freelance websites. Fortunately, Freelancer.com has some of the lowest fees out there for freelancers. Large and Active Marketplace: With millions of active users, and new jobs posted daily, this is an excellent platform to find work regardless of your expertise or experience level. Jobs for All Skill Levels: Whether you’re a seasoned writer or you’ve only written essays for school, a professional programmer or someone who’s never written more than a few lines of code, there’s a good chance that you’ll find a job that matches your abilities here. Quickly Build Up Feedback: Due to the number of jobs posted in the lower price range, it’s relatively easy to win your first couple projects and begin earning positive feedback. Limited Bids with Free Account: You can sign up for a free Freelancer.com account, but you’ll only be able to submit a very limited number of bids each month. If you’d like to submit more bids, you’ll need to pay for an account (there are many account options to choose from). Competition Can Be Stiff: While the lax sign-up policy is great for those just starting out, it leads to a higher level of competition. You may find that some freelancers’ bids are impossible to beat. You want to start your professional portfolio. As the biggest freelancing platform available, there are basically unlimited opportunities. No matter your background, you’ll be able to gain some invaluable work experience. You want to test out a few different skills. Maybe you don’t know if you’d like to focus on writing or translation, graphic design or programming. Freelancer.com offers more jobs in more categories than any other freelancing platform. You’re still unsure about freelancing, and want to give it a try on a free-to-use and user-friendly platform. 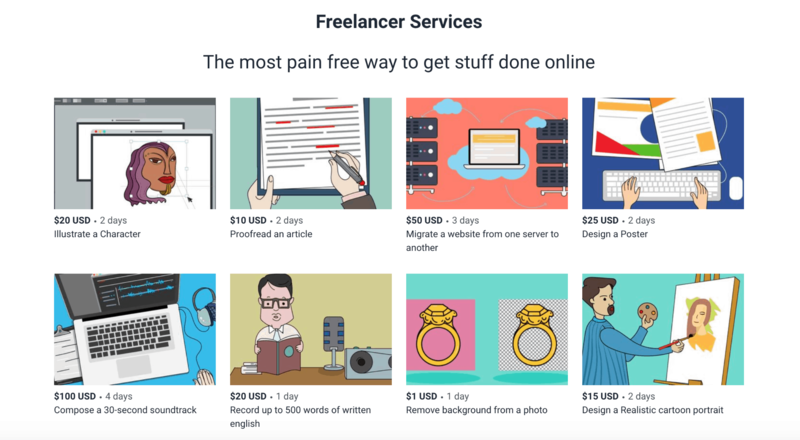 Upwork is probably the most serious platform on this list, and many freelancers use it as a means to support themselves or supplement their incomes. For students, there are many great reasons to choose this massive platform. Selective Screening Process. Before you can create a profile on Upwork, you need to be approved. This ensures that there aren’t too many freelancers with the same skill set bidding for jobs. While this dramatically limits the competition, it can be difficult to get accepted the first time around. Earn Freelancer “Badges”: Upwork helps freelancers get started and gain momentum on the platform by issuing “Rising Talent” or “Top Rated” badges to those who show promise and continually receive positive feedback. This can help you stand out from the crowd. Well-Designed Filters: This platform makes it incredibly easy to narrow down your job search by indicating specific parameters, such as experience level, project length, hours needed, number of proposals, etc. This is a great way to ensure that you only apply for projects that fit into your schedule. Less Competition: Thanks to Upwork’s screening process, there is less competition than on other platforms. Set Your Availability: With a full class load, you may only be able to spend a few hours a week freelancing. 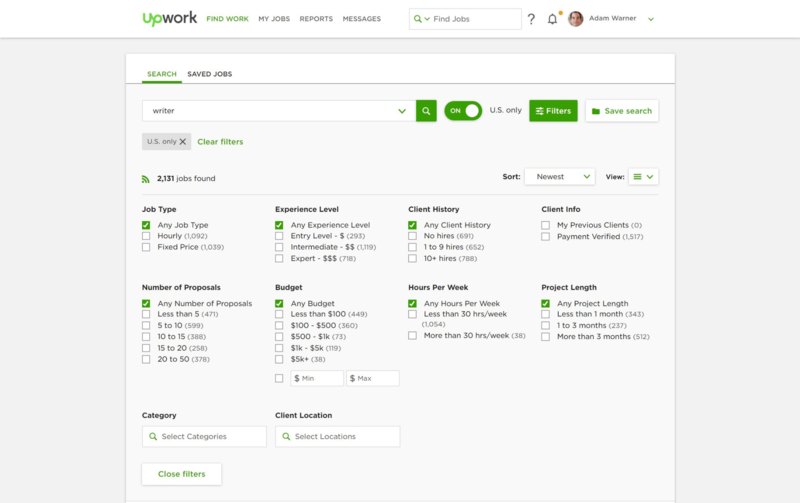 Upwork makes it easy to set your availability and view the time commitment for different job opportunities. Work for All Experience Levels: Whether you’re an expert in your field or just starting out, this platform has projects that will match your abilities. Good Potential for Earning Decent Money: Once you’ve earned a fair amount of positive feedback and developed a reputation as a trustworthy freelancer, it’s totally possible to charge a high rate on this platform. 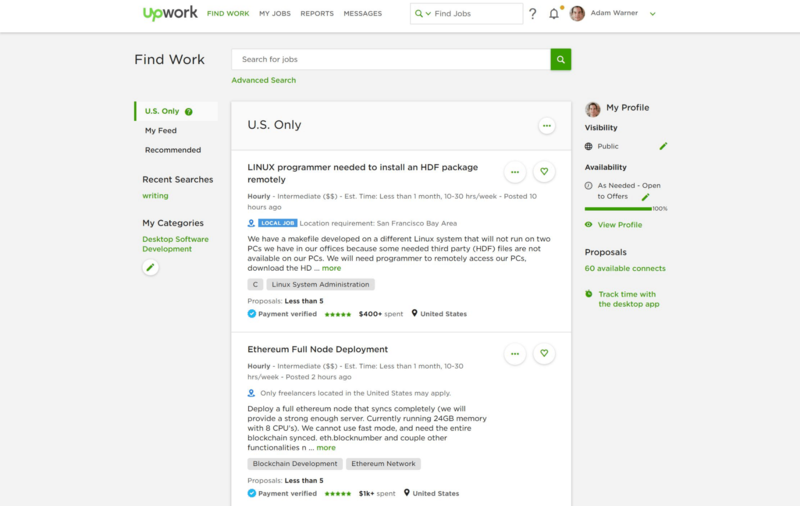 High-Quality Work and Clients: Upwork seems to draw in more serious clients than other freelancing platforms, which means higher-quality jobs at fair rates. Not the Cheapest Platform: The fee structure on this platform starts high (20% of your total earnings), but lowers over time if you continue to work with the same client. Difficult to Get Accepted: Depending on your skills and the relevant work available, it’s possible that Upwork will deny your application. If this happens, wait a few weeks, tweak your profile, and try again. Significant Time Commitment: While sometimes clients will offer you work directly, most freelancers need to spend a significant amount of time crafting quality proposals to win projects. This can be difficult for students who are already juggling a full workload. You can make the time commitment. To win a job on Upwork, you need to be ready to commit to crafting strong and personalized proposals. This takes time and effort, but is usually worth it in the long run. While there are other freelancing platforms available, these three are by far the best options for the average student looking to earn some extra cash. If you don’t have any professional skills just yet, but you have other marketable talents that you can offer, go with . This is an excellent opportunity to have some fun, while earning a little extra cash at the same time. If you’re trying to gain some more experience in your chosen field, go with Freelancer.com. There are plenty of jobs available for all skill levels and across a wide range of industries. If you’re already skilled in your field and want to develop more of a reputation before you graduate, go with Upwork. Businesses around the world trust this platform, which means that it generally has higher quality jobs. Regardless of who you are, what you’re studying, or how much free time you have, there is a freelancing platform that can work for you. Check out our ultimate guide to becoming a freelancer. If you’d like more information about what it’s actually like to work as a freelancer on these different platforms, check out our expert reviews for Fiverr, Freelancer.com, and Upwork.